Slow pages, but I am trying to pick this back up. I bend the world to my way. I have most normal features. Yet at the same time they are rugged. My fingernails are long and black. And I can use them to write my stories. My eyes are always changing. But my world is always changing. then the next moment it can be in pain and suffering. I can bend others to my will. They can do as I command. Just like in a story. Because I am the master. I make my creations beautiful. Then there are the ones I make ugly. The ones with horns and bruised skin. The ones who are put through pain and suffering. The ones who turn evil but really call out for forgiveness. I am The Writer,after all..
And what I do is write. Anyway, sorry none of you who watched me recently have gotten a personal thank you, THANK YOU FOR WATCHING ME!! I am SO sorry for being behind! I am super busy now! I will be trying to upload more again, but I make no strong promises yet. Also the Nuzlocke is slowly being worked on again. The last page came at a bad time and some other bad things are coming up again, so I am rather nervous about starting it again in paranoia... I will try to continue though! Digital program of choice: FireAlpaca. If I favorite something of yours, even if I don't watch you, I don't favorite just to get page views. I favorite art only if I really enjoyed looking at it. I see a lot of people who do stuff like that for page views, I'm just saying that I don't do that. I might not watch you, because I'm already watching over 100 people, and I don't need to delete more art than I'd like to before looking at it. Found you while looking to expand my brush collection on fire alpaca. Thanks for those. They are all supper awesome. 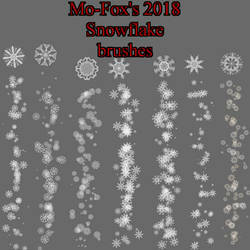 Do your firealpaca brushes by any chance work on medibang? Hey ya! I wanna wish you an amazing birthday! Hey, thanks so much for the watch! aa thanks for the favorite ! !